This is an informative and comprehensive Quality management ESSAY for Students and Professionals. 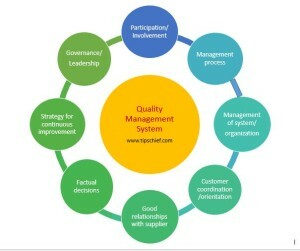 What is Quality management system ? Quality management system (QMS) is a comprehensive and basic set of rules or belief for operation and leadership purposes of a department and an organization. These principles are result of long term researches and work of pioneer and executives of managements. These principles are also guided and adopted by the top quality management organizations e.g. ANSI (American national standard institute), ISO (International system organization) etc. Its basic theme is to improve quality of product and as well as performance of an organization. QMS takes share of each stake holders of organization, from a company’s peon to CEO each and every person has to contribute for acquiring quality and productivity of long term basis. Most of standard boos and management gurus have explained following basic principles of quality management system which some time referred as TQMS or total quality management system. Organizations should aware this thing that customers are their most important stake holder. One cannot think of quality and productivity without participation of customer. Both internal (employees) and external (purchaser/user/beneficiaries) customer involvement is necessary for achieving quality. A good organization use the skills of internal customers and feedback of external customers, to get the goal of quality for acquiring QMS. Leaderships are the horses which move the cart of organization ahead, if the leaders are sensible and skillful then the organization can make progress by leaps and bounds otherwise a good and profitable organization will be ruined if the leadership and governance is bad. Leaders have to make policies, develop culture and motivate workers. A good leader and willing worker are an asset of an organization. Leaders and managers should manage all the processes through involvement of their workers and customers. All processes, actions and decisions should be under eye of the management. And a mechanism should be adopted for all decisions making. Good organizations and their executive should know their all work and actions and there should be no ambiguity among the actions and their executions. Organization should be managed as a system. It is very essential to see all the processes of the management to curb any type of corruption. Leaders and executive have to develop a system and policies to run day to day business of the organization, there must be a clear strategy for continuous development and process in the organization. All the decisions and actions should be made and done in a clear adopted strategy. Organization’s leaders and executive who made their decisions on realizing the ground realities and on the basis of facts and figures, pave the way of the organization to success and progress. Organizations must have good relations with all of its stakeholders and especially with its supplier and vendors. Good relation will ensure smooth and reliable delivery of all goods and items to the organization and company, which will ultimately augment the company’s development. There is dire need to understand the prerequisites and necessities of the customers before and after launching the new product and implementing the decision. There should be a regular wing/section in each organization to handle the affairs of the customers. That particular section must strive to build a healthy relationship with the end user.